Though highly criticized for being commercial, Mother’s Day is a front runner for the most widely celebrated holiday of the year and certainly for one of the busiest in the floral industry. All over the world mothers are celebrated in different ways, usually in May, though sometimes March or June, but nearly always with flowers. When I was growing up, my dad got my mother, my sister and I red corsages on Mother’s Day, and he wore a white boutonniere, honoring the tradition of wearing red (or color) if your mother is living and white if she has passed. 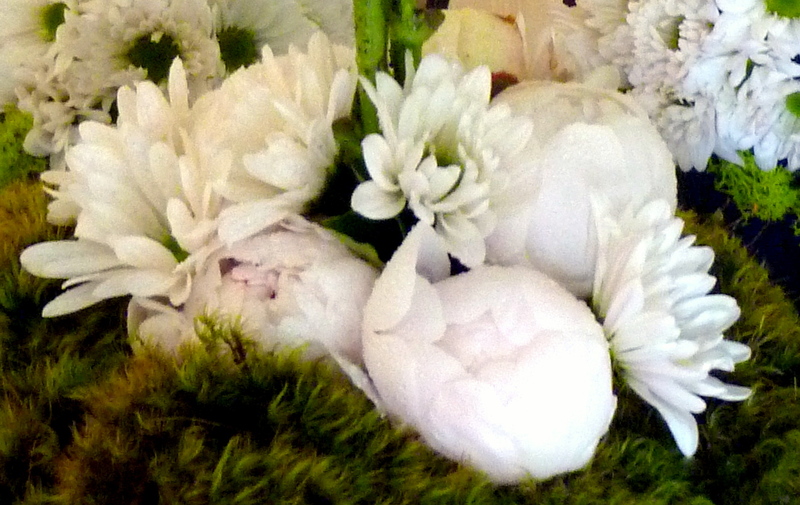 Carnations and roses are also traditional, but today any flower can say “Happy Mother’s Day,” as many traditions have been thrown over for new ideas. 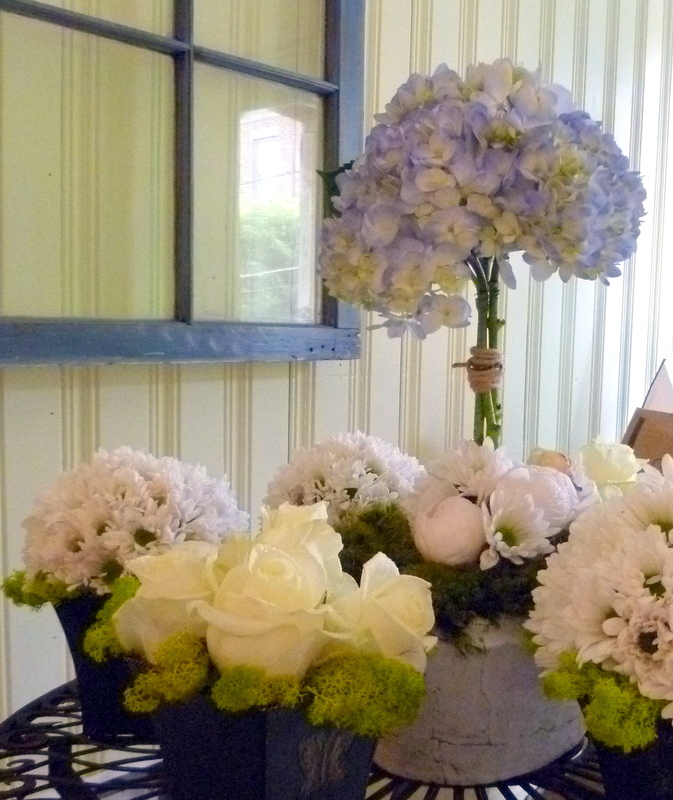 My take on Mother’s Day for one of my clients this year was a blue hydrangea topiary (she has a new baby boy) anchored with pink trimmed white peonies (her favorite) and white daisies (aka poms). I also did some mounding daisy topiaries (or pomanders) nestled on reindeer moss, and white roses mounded together and backed by the same reindeer moss. The colors are not traditionally correct, but it all says “spring” and “mom” to me. 11 May	This entry was published on May 11, 2012 at 10:18 pm. 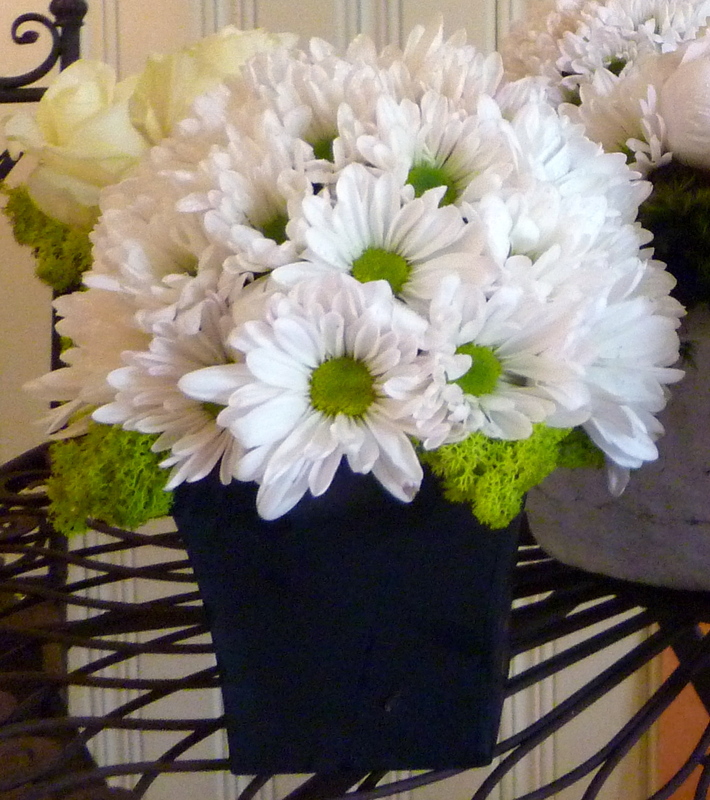 It’s filed under Arrangements and tagged blue, daisies, flower, home arrangements, hydrangeas, Mother's Day, pomander, reindeer moss, roses, spring, topiary, traditions, white. Bookmark the permalink. Follow any comments here with the RSS feed for this post.